Please excuse the broken nail. I broke it opening the box. Irony. Edit: Okay, I might at well post my review. They seem to dry super fast, like holographic colors seem to do for some reason. The thing is, they dry matte, so be sure to get a coat of Seche Vite on there if matte's not your thing. They are completely opaque in one coat, which is awesome, but they seem to have that "Big 3 Free" formula problem of being goopy and runny at the same time, so watch out for stray globs of nail polish that randomly fall off the brush. The holographic particles in these are also much smaller than the Kaleidoscope collection. I'd say they're even quite a bit smaller than the OPI Designer Series ones, too. This makes more of a holographic sheen rather than an in-your-face kind of holo like the others. It's not bad, it's just more subtle. 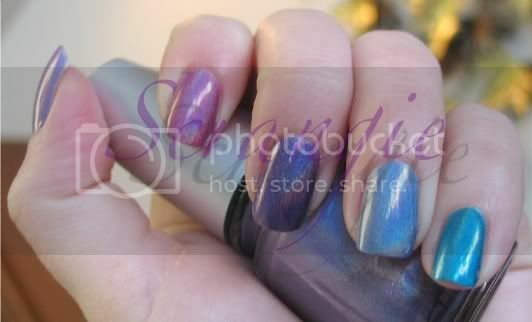 I decided on DV8 (that's the one on my pinkie in the second picture) for my manicure. I think I like DV8 and L8R G8R the best so far, and OMG seems to be really similar to the hard to find Chanel Holographic. Overall, I like them, but not as much as Kaleidoscope. Oh, and Anaconda is amazing. Bastards. OMG, WTF! And Carol's Daughter Mold.... again.